Low-FODMAP, Gluten-free, Dairy-free Pancake Recipe – With Chocolate Orange or Goats Cheese & Walnut Fillings. Shrove Tuesday, Mardi Gras, Pancake Day – it always comes as a surprise – consider this advance notice, it’s the 28th February – you’re welcome! My brother is a something of a pancake king, not a crepe or an American style pancake but a slightly thicker British-style pancake. When you make pancakes you have to allow for the first pancake to go wrong. When I was younger we christened this practise pancake ‘Sporran’. No idea why, it’s one of those ‘family sayings’ that is met with blank looks from outsiders! Either eat your pancakes with lemon and sugar or with one of the two filling suggestions. I’ve used two specific ingredients – Mature Goats Cheese and Clementine Jam – the supplier details are below. The recipe is very easy to double or treble. You can freeze pancakes in an airtight container with greaseproof paper between the pancakes. Makes 6 pancakes and a sporran. 110g gluten-free plain flour blend. Using a balloon whisk, whisk together the eggs and coconut milk. Sift the flour and salt into a separate bowl and make a well in the centre. Pour the eggs and milk into the well and whisk until blended. Allow to stand for 20 minutes. Heat a large frying pan over a medium high heat (5/6 on my hob). Put a teaspoon of oil into the pan, swirl it around then wipe the excess away with paper towel. Pour 1/3 cup of batter into the pan and immediately tilt the pan, swirling the batter until it covers the bottom of the pan in an even layer. Cook until the pancake is lifting from the edges and set on top, about 1 minute. Using sleight of hand or a fish slice flip the pancake and cook for a further minute until the pancake slides free around the pan. If you are keeping these warm, place on a plate in a warm, not hot, oven and layer the pancakes with greaseproof paper. Lightly grease the pan again, using a couple of drops of oil and the paper towel and repeat until all the batter is used up. I have already waxed lyrical about the joys of St. Helen’s goat butter and cheese, not least because unlike some goats’ products it doesn’t taste of goats! Have you tried the mature version of their cheddar type cheese yet? It’s delicious! See here for details. You can use other sorts of low-FODMAP friendly mature cheese, or a chevre but I do so love the walnut/ goat’s cheese combo. Handful of finely chopped curly parsley. When the pancake is cooked, cover one half in cheese and walnuts. When it is just starting to melt, slide out of the pan onto a warm plate. Scatter the parsley over the cheese and flip the other half over the filling. You can do this with a ready cooked pancake by reheating it in the pan before covering with cheese. A pancake that tastes like Jaffa Cakes? Yes please! I get my Corsican clementine jam from French Flavour. Clementines are thankfully low-FODMAP and the rest of the ingredients are FODMAP friendly. Although untested, it’s closest relatives are marmalade or strawberry jam both of which have a portion size of 2 tbsp. You could use another orange jam or marmalade but I can’t guarantee it’ll be as Jaffa-Cakey! When the pancake is cooked, spread the jam over one half and sprinkle the chocolate chips on top. When the chips are just beginning to melt, fold the other half of the pancake over and slide onto a warm plate. . You can do this with a ready cooked pancake by reheating it in the pan, before adding the filling. I have not been paid to endorse these products but I've found them and enjoyed them - I hope you do too! Cheese – 40g hard and a goat’s cheese such as chevre are high in fat so low in FODMAPs. Do check your individual cheese if you are using a different sort. Clementine Jam – Marmalade is 2tbsp, Strawberry Jam is 2tbsp. Check your ingredients for high fodmaps. Early spring and slow-cooking go hand in glove. It’s cold and it can sometimes be a struggle to ever remember what it’s like to have a light evenings. In the evening you need a meal to be ready on your return, welcoming you back with its warming aromas. This easy dish is ideal for rice, jacket potatoes, mash or even poured over crusty low-FODMAP bread. You can use chicken, beef or vegetable stock, do check the ingredients for high FODMAP's if you are not using homemade. If you do not have a slow cooker bake in a heavy lidded casserole at 160°C for 3-4 hours. Use 400ml of stock, checking regularly to make sure it doesn’t dry out. That's some parsnip puree hiding in the background. Peel and slice the carrots. Slice the tomatoes into 4 horizontally. Cut out the stalk from each top slice of each tomato. Warm the oil in a frying pan over a medium high heat. Fry the carrots, stirring often for 3 minutes. Put the carrots in the slow cooker. Fry the shoulder steaks off in the frying pan for one minute each side. Place the steaks on top of the carrots. Add the tomatoes to the frying pan and fry for a minute on each side. Scatter the thyme sprigs and salt flakes over the steaks then cover with the tomatoes. Return the pan to the heat and pour in the stock. Scrape any stuck-on juices from the bottom of the pan into the stock and pour into the slow-cooker. Cook on low for 8-9 hours. Using a fish slice or slotted spoon, gently lift the steaks out of the vegetables onto a warm plate. They may break up a little but you can reassemble on the plate. Remove the woody thyme sprigs from the vegetables. Using a hand-held blender, whizz up everything left in the slow-cooker until smooth. Season to taste. Serve the steaks with the sauce poured over the top – yum! Garlic Oil - Oil should be infused with garlic to keep the FODMAP’s out! I love the colour-way of a radish; bright fuschia globes with a crisp white interior standing out on any salad platter. But how best to eat a radish in February? I have boiled radishes in broths but they lose their colour. Roasting radishes however, brings an entirely different shade to my gastronomic colour-scheme. They become pink, so terribly, terribly pink! It’s worth mentioning they taste nice too, slightly peppery, ever so slightly crunchy and slightly sweetened by the experience. Serve with baked fish for the prettiest little plate you ever did see. In a small baking tin, toss all the ingredients together. Bake for 15 minutes, turning over halfway through. If the radishes are particularly large you may need to bake for a further 5 minutes. Serve on a warm plate. Radish – FODMAP’s were not detected in this food. Eat freely and according to appetite. Low-FODMAP Chocolate and Raspberry Pudding Cakes - gluten-free and vegan recipe. Ahh, Valentine’s Day. I’m of the mind you shouldn’t restrict your romance and affection to one day a year. However, my daughter has other ideas and feels grand gestures should be compulsory. Therefore, I shall be demonstrating my love and affection to my family by making these low-fodmap, gluten-free, vegan, chocolatey-raspberry treats. In return they can show their love and affection to me by not bickering and doing their homework without me having to nag. I’m using frozen raspberries as they’re readily available. You need to have 9 fairly good-looking ones for the tops but the others can be a bit battered. When using coconut cream, empty the can or tetrapak into a bowl first and beat with a spoon to thoroughly combine, before weighing out. Any unused cream can be kept in the fridge in an airtight container. Please do not panic if the tops go cracked – they’re going to be smothered in choccy topping. FODMAP friendly portion sizes at the bottom. Pre-heat a fan oven to 150°C. Line a muffin tin with 9 paper cases and place 3 raspberries in the bottom of each case. Sift the flour into a bowl and make a well in the middle. In a small pan, melt the margarine, sugar, golden syrup and milk over a low heat. Stir with a wooden spoon as it warms, do not let it get hot. When it no longer feels grainy on the spoon, stir in 30g of the chocolate and remove from the heat. Keep stirring until it is all combined and melted. Pour the chocolate mixture into the well in the flour and whisk well with a balloon whisk. Pour the batter into a jug then pour over the raspberries, splitting the mixture evenly between all 9 cases. Bake for 25 minutes. When baked, leave to cool in the tin. Place a tightly fitting heatproof bowl on top of a pan of simmering water. Add the coconut cream and stir until it is smooth and just warm. Stir in the remaining 70g of chocolate until it just starts to melt then remove the pan from the heat. Continue stirring until it is completely smooth. Remove the bowl from the pan and leave to cool for 10 minutes. Whisk for 5 minutes using an electric hand-held whisk. Keeping the cakes in the tin, spoon the chocolate on the cakes to as near to the top of the cases as you can. Leave to cool and set. Lift the cakes out of the tin using a palette knife. I like to remove the paper cases before serving. Place a ‘good-looking’ raspberry on the top and if you’re feeling fancy, sift over a little icing sugar. Golden Syrup – ½ tbsp. This is a sample of how we do Valentine's Day - Homemade Moomin Cards. Like our family sayings - I have no recollection how we started this but after 16 years we're amassing quite a collection! They no longer look like Moomins but strange creatures that find themselves in a variety of unusual situations. I’ve lost track of the times I’ve had social media conversations about swedes (that’s the root vegetable, not the Scandinavians!) Outside of the UK this root vegetable is known as rutabaga, from the old Swedish word ‘rotabagge’ which roughly translates as ‘short, stumpy root’. Sounds so appealing! Parts of the UK call these swedes (from ‘Swedish turnip’) but some areas call this a turnip (not to be confused with white turnips.) In Scotland they are called neeps, unless you’re in an area where they’re called baigie or tumshie. Confused much?! If nothing else, this complex introduction shows how deeply ingrained this useful vegetable has become in British cuisine since C18th. I’ve added the ubiquitous turmeric to really bring out the colour of the golden flesh. The strong flavour of the swede can take the fragrant punch of the rosemary. Now the difficult portion control bit - a low-FODMAP serving is 65g. An average swede is 800g. I have chosen to cook the entire swede as my family are happy to eat more than I am allowed. There is also the option to freeze any leftovers. I layer mine between greaseproof paper in an airtight container. Keep the chips apart and it will be quicker to defrost a single portion to add to a lunch. As a guide, I weighed the chips and 5 1x8cm chips came in as a low-FODMAP serving. These work well as a side to my Cheese and ‘Onion’ Potato Bake. Pre-heat a standard oven to 220°C. Peel the swede and cut into 1cm wide chips. Place the oil in a large baking tray, add the remaining ingredients and turn everything over until all well covered and in one layer . Bake for 30 minutes, turning over halfway through. Thankfully butter is low-FODMAP and I feel no fear about throwing it into my food at the slightest opportunity. If you are a ghee advocate then do please substitute for the butter. The benefit of this dish is that it does not require a fish stock. As the hot water reduces it almost emulsifies with the butter to turn it a delicate, primrose yellow. The flavour will intensify as it reduces. As an addendum, I have made this with a frozen fish portions putting the frozen fish straight into the water. I can’t say it has altered the flavour at all, but it has made my life easier when I’ve forgotten to defrost any fish! I’ve given you the recipe for 2 portions, as I’ve realised not all of you are feeding a family of four, but you can easily multiply the recipe. I serve this on its own for a light meal or in a bowl over rice for a main meal, (see picture for both options). If you can find some good low-FODMAP crusty bread, it works as a delicious mop for the yellowy broth. In light of the news of vegetable shortages, I've had to rethink this month's recipes! If you cannot find baby spinach, look for some homegrown perpetual spinach. It will need a good wash, tough stems removing and a slightly longer cooking time but will still be terrifically good for you. If you are serving with rice, start cooking this while you prepare the broth. Warm two soup bowls. Place the fish in a medium sized pan with the bay leaf, peppercorns, thyme and water. Bring to the boil, cover and turn down to a simmer for 6-7 minutes, until the fish flakes easily. It is difficult to be exact, as the cooking time will depend on the thickness of the fillet. When the broth has reduced, stir in the spinach and basil. Cover and allow to wilt for a minute. Remove from the heat. Take out the woody thyme sprigs but leave any thyme leaves. Add the flaked fish back into the pan then taste and adjust the seasoning. If you are using rice, place a portion in each bowl before sharing the broth between the bowls. Fish is high in protein and does not contain carbohydrates. Butter is high in fat and does not contain carbohydrates. Carrot – Eat freely and according to appetite – suggested serving 61g. These delicate little biscuits make a sweet accompaniment to my favourite January FODMAP friendly fruit, blood oranges. It’s always a gamble knowing how bloody an orange will be. Some will have a beautifully mottled ruby skin but a disappointingly plain orange interior. It’s not the end of the world, as these biscuits will work year-round with any sweet orange. The biscuits will soften slightly over time so keep in an airtight container if you are not eating them straight away. I have tried making this recipe using a fan oven but it didn’t work as well as using the oven on a standard setting. I have made this recipe 3 times and each time the mixture has made 24 biscuits, the little dollops will be very small but will spread considerably, do leave enough room. Serve with one orange per person. To slice the oranges, cut the top and bottom off the fruit and stand on a chopping board. Using a fearsomely sharp small, knife, cut away the peel in strips from the top to the bottom, following the contours of the orange. Cut the flesh into slices as thinly as you can. Not as bloody as I'd hoped for! Pre-heat a standard oven to 180°C. Line two baking sheets with non-stick paper or silicone liners. Adjust the shelves inside the oven until they are two-thirds of the way up the oven. In a stand mixer, or using electric beaters, whisk together the butter, sugar and orange zest, scraping down the sides of the bowl as necessary, until it is light and fluffy. Whisk in the egg, it will look curdled to begin with but continue until it looks evenly combined. Mix together the flour and polenta and add to the rest of the mixture. Whisk again until everything is fully combined, scraping down the sides of the bowl with a silicone spatula as necessary. Using a teaspoon, place 6 small blobs on each sheet, each blob being 2cm -2.5cm diameter. Bake for 6 minutes, until the outside has brown and the middle still golden. Remove from the oven, allow to stand on the tray for 1 minute before gently lifting off the tray with a small palette knife and placing on a cooling rack. Remove the paper or liner from the trays, and ‘reload’ with the remaining mixture. Slide the blobbed liners onto the baking sheets and bake. Do watch these like a hawk – they can turn black within a minute! Use my picture as a colour guide. A winter-warmer I’ve been eating at any given opportunity. Although the recipe seems like a very basic vegetable soup, the herbs and spices all have their nutritional place. I deliberately don’t add the ‘protein of choice’ until the end. You can portion up the soup and freeze for quick, filling lunches. By adding your protein just before serving, you can ring the changes and have a different lunch each time; simply re-heat the soup-stew and stir in. We still have air-dried ham leftover from Christmas which I diced up to use for the picture. You can of course use a mixture of several proteins. I hope you will experiment and see how adaptable this soup is! 1 litre stock chicken, beef or vegetable stock or if you have some, bone broth. The following measures are given per person. Add to heat through, before serving. Warm the coconut oil in a large pan over a medium high heat. Add the carrots, parsnips and thyme sprigs, and cook for 3 minutes, stirring regularly. Add the potatoes, tomatoes, sage, turmeric, pepper and salt before cooking and stirring for a further 2 minutes, making sure it doesn’t catch on the bottom of the pan. Stir in stock, cover and bring to the boil before turning down to a simmer for 20 minutes. Remove the woody thyme stalks. The soup will be cooked now but if it needs to stand for a while, it won’t harm, the flavours will simply mellow together. If you are freezing this, stir in the parsley and cool fully before portioning it up. If you are serving now, add your chosen protein to heat through and stir in the parsley at the last minute. Parsnip - Eat freely and according to appetite – suggested serving 62g. Potato - Eat freely and according to appetite – suggested serving 122g. Tomato – Common, eat freely and according to appetite – suggested serving 119g. Meat is high in protein and does not contain carbohydrates. Check ingredients of processed meats for high-FODMAP ingredients. Low-FODMAP Cheese and 'Onion' Potato Bake - Yes, FODMAP friendly onion flavoured recipe! ONION?! A low-FODMAP blog suggesting an onion recipe? Have I not read the guidelines?! Well yes dear readers I know the guidelines but I also know that oil and water don’t mix. The FODMAPs in onion responsible for making our tummies miserable are oligos-fructans and they remain in the water of the onion (or garlic). By infusing oil with onions and then discarding the onions, the oligos-fructans stay with the water, in the onion, in the bin. There are many how-to videos about how to infuse oil all over the internet. (No-nonsense eHow example here) You can certainly use the oil straight away but do take care particularly when making your own garlic oil. It is fine to use straight away but there is a risk of botulism if you store it for more than 3 days. Although I use shop-bought garlic infused oil regularly, onion oil is one I have to make. Imagine how thrilled I was to receive a bottle of Cobram's roasted onion infused extra virgin olive oil, bringing Australian sunshine to our British chilly midwinter. I love ‘playing’ with new ingredients, one of my little games tasted just like cheese and onion crisps – I didn’t realise that I had even missed cheese and onion crisps! Realising whatever I was going to do with the oil was now going to have to include cheese, I set to work. Crunchy on top, squidgy in the middle. You can get ahead of yourself and boil the potatoes the day before. The dish involves very little effort, 20 minutes boiling, 15 minutes baking and only 3 minutes actively assembling. I simply serve this with a Help-Yourself Salad Platter, which can be prepped while the potatoes bake. You should also know, this makes delicious leftover-lunches. Pre-heat a standard oven to 240°C. Boil then simmer, the whole potatoes for 15-20 minutes until they are tender to a knife-point. Drain the potatoes then stand them in a colander for 5 minutes to cool and dry. In a large baking dish (mine measures 28cm x 19cm), put the olive oil with one tablespoon of the onion oil. Tip the dish to cover the base in the oil. Tumble the potatoes into the dish and press lightly with a potato masher until the skins have burst and there is an even layer of crushed potatoes. Sprinkle over two thirds of the cheese, the thyme, the remaining onion oil and black pepper to taste. Using your hand, turn everything over until it is thoroughly jumbled. Sprinkle over the remaining cheese. Bake for 15 minutes, until the top is golden and crunchy. Olive Oil is high in fat and does not contain carbohydrates. Gone are the days of a Christmas pudding: heavy, rich and laden with pounds of FODMAP fruit and rum. The curious thing is that the only person mourning this loss seems to be me! The children were never keen on Christmas pudding and my husband is more a cake person. This pudding is more of a sponge cake. I don’t usually cook cake in a microwave* but in this instance, when every surface in our tiny kitchen is covered in pans and detritus from the main course, I simply don’t have enough hob space to steam a pudding. You can weigh all the ingredients and cream the butter and sugar ahead of time. The final assembly should take no more than 5 minutes. My family love this with custard and the children can cheerfully use the recipe from the Our House For Tea cookbook to take charge of this task. You can see how quickly this comes together in the video here but do please ignore my eyes - I was having some sort of allergic reaction! Please don’t be confused by the quantities of flour, butter, and sugar! As an example my eggs weighed 124g so I had 124g flour, 124g butter, 62g light muscovado sugar and 62g white sugar. Place the cranberries in a small bowl and cover with the orange juice and leave to soak. Grease a 2 pint microwave safe basin thoroughly with butter, if you have a lid, grease that too. Otherwise grease a piece of cling film to make a lid. Put the marmalade in the bottom in an even layer. Cream together the butter and sugars in a mixing bowl using a wooden spoon at first then graduating to an electric hand whisk. When it has become fluffy, whisk in the orange extract. Sift the flour and spices together in a separate bowl. Lightly beat the eggs in a separate bowl. Add to the butter and sugar with a tablespoon of flour. Whisk thoroughly, scraping down from the sides as necessary. Using a large metal spoon fold in the remaining flour until the mixture is combined. Lightly crush any overly large pieces of walnuts and fold those into the batter along with the cranberry and orange mix. Place the batter mix on top of the marmalade as evenly as possible. Cover with the greased lid (or greased cling film) and microwave on high (800W Cat E oven) for 6 minutes. Remove the lid, gently loosen the edges with a palate knife and place your serving plate on top. Turn the plate and pudding over together then remove the basin. Cover any mistakes you made removing the pudding, with holly sprigs or icing sugar. * I had some enquiries about whether it is possible to steam this pudding - it is! Butter a 2 pint pudding basin (one with a lip around the outside edge.) Butter a sheet of greaseproof paper and lay it on top of a sheet of foil. Make a one inch pleat in the middle of the sheets. Place the marmalade then the batter mix in the basin. Cover with the pleated greaseproof paper and foil and tie tightly around the edge with string. It is a good idea to make a string handle to lift it out of the pan with. Steam on a trivet in a large pan of simmering water that comes halfway up the basin. After steaming, remove the lid and string. Run a thin palette knife around the edge of the basin and turn out onto your serving dish. These pictures aren't nearly as good as the ones my husband takes but they prove it can be done! You won't have as much of a marmalade core as a marmalade topping. As much a part of Christmas as Christmas trees and stockings, a bowl of clementines becomes our table centrepiece for most of the festive season. I love it when I am able to get a box of clementines with their glossy green leaves still attached. Thankfully low-FODMAP, a clementine can add a much needed vitamin C boost to a season peppered with colds and chills. Aside from the pleasing alliteration, this side dish provides a festive twist on my favourite combination of carrot and oranges. Carrots are another Low-FODMAP vegetable that Monash says we can 'eat freely and according to appetite' no less! Please do endeavour to find mace – it adds a delicious nutmeg-y spice to the carrots. If you can only find blade mace, grind it yourself in a pestle and mortar. You can watch a video of how to prepare this FODMAP friendly dish here. Place the carrots in a lidded pan with 100ml of water. Wash and lightly scrub the clementines to remove any residual wax. Finely grate the zest from one clementine over the carrots and add the juice of both clementines to the pan. Add all the remaining ingredients, cover and bring to the boil. Turn down to a low simmer for 10 minutes to allow the carrots to steam but not burn the juice. Remove the lid and turn up the heat for 5 minutes to reduce the liquid, taking care not to boil the pan dry. Serve in a warm dish. Less of a drink, more of a medicine, my hot toddy recipe will have you feeling cosy in no time. Suitable for those occasions when you’re not quite properly poorly but nonetheless, in need of an early night and a blanket. Black peppercorns, ginger, star anise, cinnamon, lemons all have anti-inflammatory, antiseptic or healing properties; the whisky helps you sleep and the spoonful of sugar? Well, it makes the medicine go down! You can miss out the straining stage if you’d prefer but it does make it a little easier to drink! Watch my 'how to' video here. We happened upon Pineapple and Ginger Fizz one evening when The Little Miss and I found ourselves waiting for my son to finish Scouts. It was belting down with rain and I’d run out of things to do while we waited. Every café was shut and we ended up in quite a nice bar. Little Miss clearly thought this was quite ‘the thing’, going for a grown up drink and took it all very seriously. The key to this drink is the crushed ice: the volume of ice is deceptive and can trick you into thinking you’re having more of a potentially tummy troubling ingredient like fruit juice, than you actually are. Meaning you can have another! 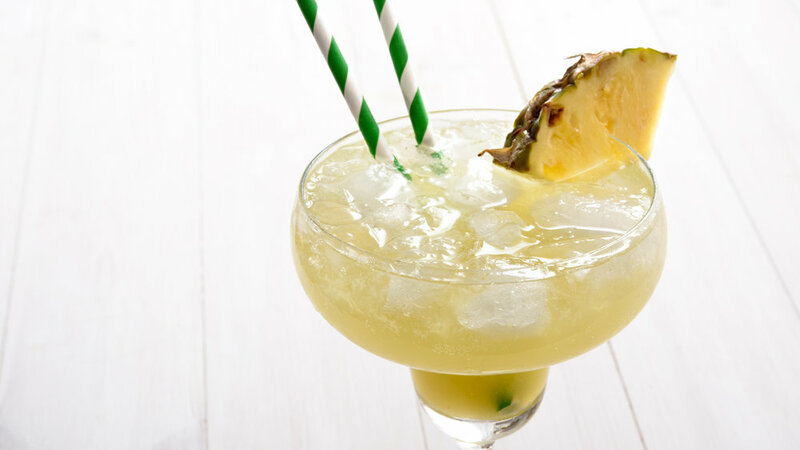 Fill a margarita glass 2/3 full of crushed ice. You can of course use any glass but I like to make it feel special. Add the pineapple juice and grate in the ginger root. Squeeze the lime wedge over the ice and top the glass up with soda water (and vodka if you are using it!). Decorate with the pineapple wedge and straws / umbrellas/ dancing girls as you see fit. Cheers Little Miss! Christmas Prawn Cocktail Two Ways - Low-FODMAP, gluten-free, quick and easy! Which one's prettier? You decide! I like a prawn cocktail for a Christmas dinner starter, yes it may sound twee and dated but so are most of our Christmas traditions. Each year we add a new animal to our nativity scene, this year it’s an armadillo: he’ll sit nicely next to the panda and tiger. There is nothing minimal in our decorations, we like it to be gaudy and exuberant. However, I do like to keep my food prep minimal. I used to shut myself away in the kitchen for what felt like most of Christmas day before I came to my senses and realised I’d actually rather spend the time with the family. These prawn cocktails are definitely minimal in their prep and easy enough for a child to take charge making. 12 washed little gem lettuce leaves. Mix the mayonnaise, tomato puree, paprika and salt together in a small bowl. Add the prawns and turn everything over until it is well coated. Arrange 6 of the lettuce leaves on a platter. Spoon the prawn mixture evenly between the lettuce cups. Snip the chives over the top of the prawns. Mix everything but the prawns together in a small bowl until well combined. Add the prawns and turn everything over until it is well coated. Arrange 6 of the lettuce leaves on a platter. Spoon the prawn mixture evenly between the lettuce cups. Is there any vegetable more crucial to the Christmas dinner than the humble but unfortunately high FODMAP Brussels sprout? Even those who dislike sprouts see it as vital that there should be sprouts on the table. I am, or was, a great sprout lover but a low-FODMAP safe serving is a measly 2 sprouts. I was left with the riddle of how to make my duo of sprouts go further and seem like I was eating more. Challenge accepted. It's important they still look sprouty. Pancetta is a great partner to sprouts; the courgette can bulk up the greenery without overwhelming the sprout flavour. By shredding the sprouts lengthways the leaves should stay together enough to stay recognisable as sprouts. There is a joke about people who put their Christmas sprouts on to boil in October so all you have is a smelly mush. This dish is the antithesis of that meme: it takes minutes to make and can be thrown together just before serving. You can see how quickly it comes together in this video. Warm the olive oil in a wide lidded pan over a medium-high heat. Add the pancetta and fry for 3 – 3 ½ minutes, stirring often, until the fat is a golden brown and starting to render down. Throw in the sprouts and courgettes and gently turn over so as not to break up the sprouts. Add 3 tbsp. of water cover and cook for 4 minutes, stirring occasionally. Add the butter, turn over again and remove from the heat. Gently stir in the parsley and pepper. Remove to a warm serving dish. Perfect Roast Potatoes and Parsnips - low-FODMAP, gluten-free, crispy and golden. A perfect roast potato is for life, not just for Christmas. I make my low-FODMAP roasties a little more festive by adding parsnips – this can help your Christmas cooking schedule, as you just need one roasting tray. Although I enjoy a maple roast parsnip as much as the next glutton, I find maple is one flavour too many on an already rich and flavourful Christmas plate. Both parsnips and potatoes have the Monash listing of 'FODMAPs were not detected in this food. Eat freely and according to appetite' - there you go guys, get roasting! You can peel and chop the potatoes and parsnips the night before and keep in separate pans of water. Do not soak them together as the parsnips will flavour the potatoes. Soaking the veg will remove some of their starchiness and make for a crispier roast potato. If you wish to be even more prepared, then you can also par-boil the veg the night before. Allow the steam to escape and fully cool before keeping in a cold place. You can substitute sunflower oil for the goose fat but it won’t be as crispy. So here you are, crispy and golden on the outside, fluffy and sweet inside, I give you my perfect low-FODMAP roast potatoes and parsnips. You can watch my how-to guide here. Pre-heat the oven to 200°C/ 185°C Fan oven. Peel the potatoes and parsnips. Cut the potatoes into similar sized pieces (if you want to be exact, each piece is between 35g and 45g!) Cut the parsnips into similar sized pieces, I usually cut the thick piece into two and the longer stem whole. See my video for a guide. Either soak the potatoes and parsnips in separate pans of cold water overnight or give them a rinse to remove some of the starch. Change the water in the pans and add a large pinch of salt to each pan. Bring to the boil. Once boiling, boil the parsnips for 4 minutes and the potatoes for 8 minutes. Drain separately in a colander. Allow the veg to cool slightly and the steam to escape. Place the goose fat in a large, heavy-duty roasting tray and pop into the oven for a minute. Place a lid over the colander and give the potatoes and parsnips and shake to rough up the edges. When the fat is smoking hot remove from the oven. Using a spoon, very carefully add the potatoes and parsnips. Turn everything over in the pan until it is fully coated in goose fat and in one even layer. Scatter the thyme stalks over the top of the potatoes and parsnips and return to the oven for 45 minutes. After 45 minutes check in on the potatoes and turn over to ensure maximum crispiness. Return to the oven for a further 15 minutes, remove the thyme stalks and place into a warmed dish - I like my potatoes and parsnips to be piled high. Scrunch the sea salt flakes over the top. Rinse the red cabbage and place in a small-ish lidded pan with all the other ingredients. Cover with the lid and bring to the boil over a high heat. Immediately it has started boiled turn it down to a low simmer for 10 minutes. Remove the lid and simmer for a little longer (around 5 minutes) until the water has evaporated and the cabbage is glossy. Keep an eye on the cabbage, as it is important the pan doesn’t boil dry and burn the sugar. Remove to a warm serving dish. Bacon - optional: cosy feeling - obligatory.